Defender James Justin is happy to showcase his versatility if it enables him to be out on the pitch more for the Hatters this term. The 20-year-old has played the majority of his 73 appearance for the club at right back since making his debut in May 2016. I used to play there when I was younger, so it’s not too unfamiliar, and I feel like I played well. However, when attacker Elliot Lee went off injured at the weekend against Scunthorpe United, boss Nathan Jones moved Jorge Grant to the tip of the diamond and turned to Justin to fill the void in midfield. It was of no concern to Justin, as he said: “That’s why I’ve added another string to my bow, and that’s why I’m playing in midfield more. 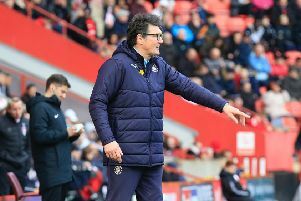 After a stop-start season last term, Justin has been restricted to just two starts in the league for the Hatters this term, his last coming against Wycombe back on September 1, that also in midfield. With full backs Jack Stacey and Dan Potts both in fine form once more this term, then Justin knows he will have to remain patient again, saying: “It is frustrating personally, but as a team we’ve been on a good run, so I can’t really complain. Justin did a bit more than what was needed as Luton ran out 3-2 winners at the weekend, as he got the crucial third goal, turning in Stacey’s cross with five minutes to go. He added: “It’s always nice to come on and get a goal and three points. “It was a personal achievement for the gaffer, 150 games, not a lot of gaffers do that nowadays and it just shows you how good a manager he is, so it was nice to get three points.